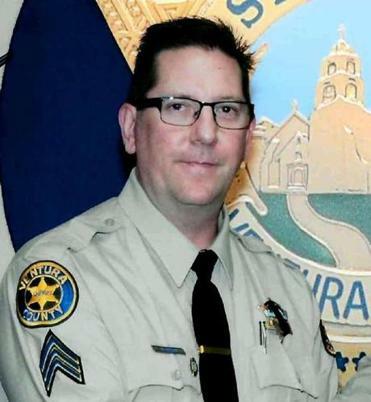 THOUSAND OAKS, Calif. (AP) — Friends are remembering sheriff’s sergeant who was killed trying to stop a shooting rampage at a California bar as a ‘‘cop’s cop’’ who didn’t hesitate to run toward danger. Firefighters are honoring Sgt. Ron Helus with a giant US flag raised by two ladder trucks over the route. People are lining streets as the hearse passes. ‘‘But unfortunately, you go into the unknown, you know there’s shots being fired, obviously the suspect was in there and ready for him,’’ he said. ‘‘(He) said to her, ‘Hey I got to go handle a call. I love you. I’ll talk to you later,’’’ Dean said. ‘‘He went in there to save people and paid the ultimate price,’’ he said.